My new found friend Florence (Bliss in the Kitchen) from France was so sweet to enclose a recipe she got from her mum’s aunt when she sent me her BBM package. It’s called Gateau Princesse and it’s supposedly an apple cake. Hmmm however mine turned out like apple pudding. I’m not sure if it’s because I read the recipe wrongly. The steps were quite vague and I just went along with whatever baking instincts i had. I liked how it turned out though. It was a nice warm dessert to have in the morning. Apples are good. . . especially those cooked warm in pies or puddings eh? 3. Pour in the eggs, one at a time, and the milk, until smooth. 4. Put in a pre-heated oven at 180 degree celcius. *Note: I used brown sugar instead of normal white sugar. 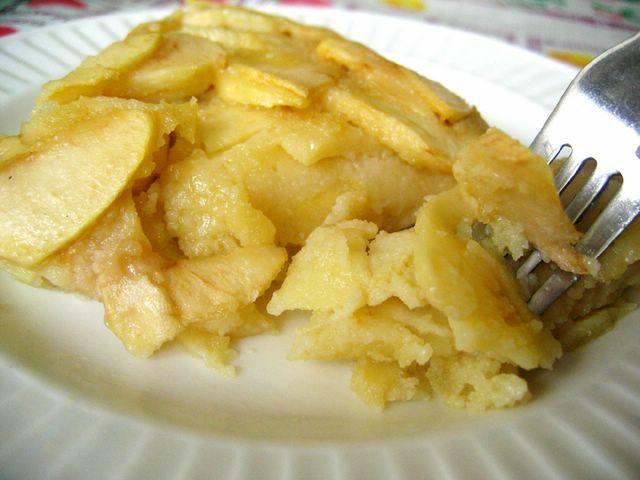 The recipe didn’t say whether to lay the apples layer by layer, so I simply mixed the whole lot with the mixture. I used Royal Gala apples. Hiya! This looks great. I would like to make this one day. I love apples, they are so sweet when cooked. About the recipe, is it heaped tablespoon or level tablespoon. Hm. It sounds a bit like a clafoutis, especially since it came out with a puddingy texture. How long did you end up baking it? hi naranja, well I used the measuring tablespoon, level. have fun! heya nic, whoa, i think i baked it for about an hour! ya i’m still confused as to whether it’s meant to be a cake or a pudding… perhaps both? Maybe you can try Granny Smiths the next time. Green apples usually turn up fabulous for cooking. Kia Ora (Hello) from a krazy blogger down-under in New Zealand. You have a really great blog. Can I mention it on one of my blogs ? I have been reading your blog and I am so impressed with your recipes and photos and I have decided to write to ya!!! Kudus!!! I hope you don’t mind me tagging you for MeMe: Childhood Food Memories. I just can’t wait to hear about your favourite childhood food memories. Hope to read about it soon. heya jadepearl, thanks! i just checked out your blog too and it’s great! one more food blog to add to my favourites. Thanks! 🙂 I hope you don’t mind adding your blog to my fav too! Can’t wait to hear about your meme! i’m so glad you made the cake! nic is right, it’s close to a clafoutis. but it shouldn’t be a pudding, it should hold itself like a cake. maybe it turned out this way because it didn’t cook long enough or you didn’t let it cool down before unmolding (that happens to me A LOT! )… but i know my instructions were quite vague, as to me, it’s that kind of recipe you make instinctively!! Anyway thanks for trying the recipe!! did i write 2 eggs on my recipe? it’s 3 you should use! OOOOppps! heya flo! ya maybe I should have let it cool more. but then again it could also be the apples i used? there was alot of moisture in this cake. oh 3 eggs? haha ya i think you wrote 2… okay time to try out this recipe again! hahaa….